I was pleased to finally complete my ” A Modern Welcome ” Block of the Month we have been doing on the Always Playing with Thread blog. Judy has been posting the instructions each month, and I have been trying to keep up with each step. 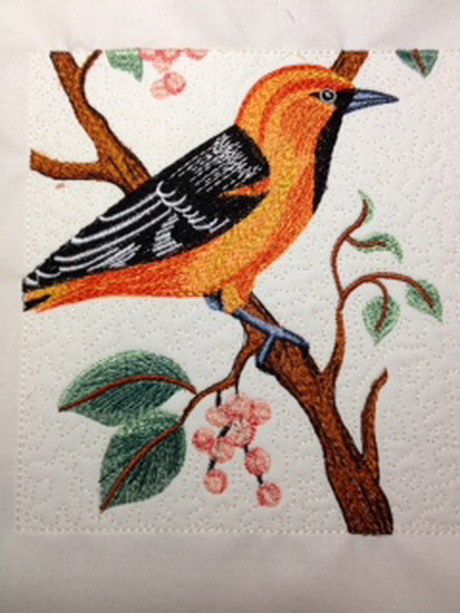 It has been fun, and although I consider myself to be an experienced quilter, I have enjoyed following her instructions on how to make flying geese or four patches or half square triangles. 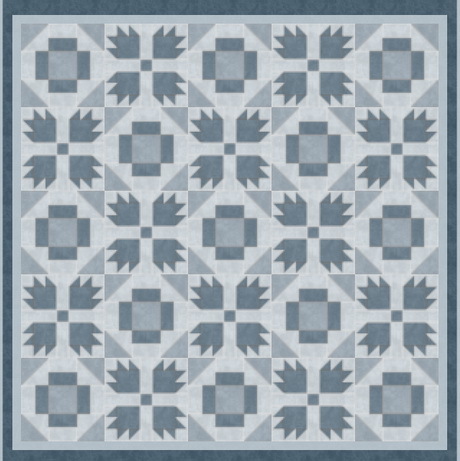 I designed a different centre block and have worked with a completely different set of charm squares I was given by Judy. 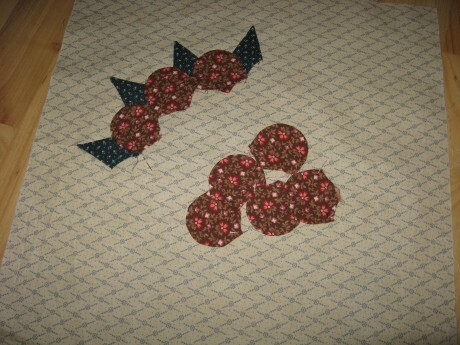 I’ve added another vine, leaves and berries in the right hand side of the block instead of doing some extra embroidery. Here Ne12 Cotton Mako was used. For the backing I used some of the remaining charm squares and some of the white fabric I used for the front of the quilt. 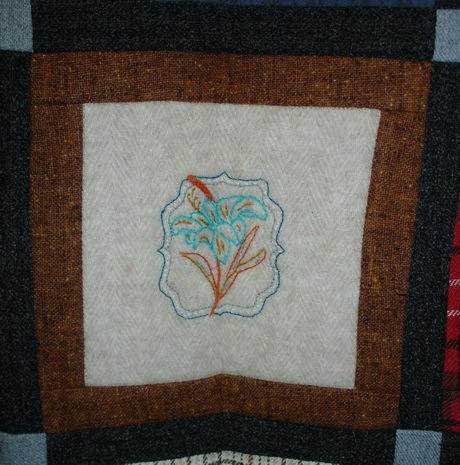 This modern quilt was sewn in Ne 40 weight Cotton Mako – and was minimally quilted in the same weight of thread. I used 2021 (white), 1125 (blue) and 2524 (violet) – these threads are always a dream to use and I never have problems with them. 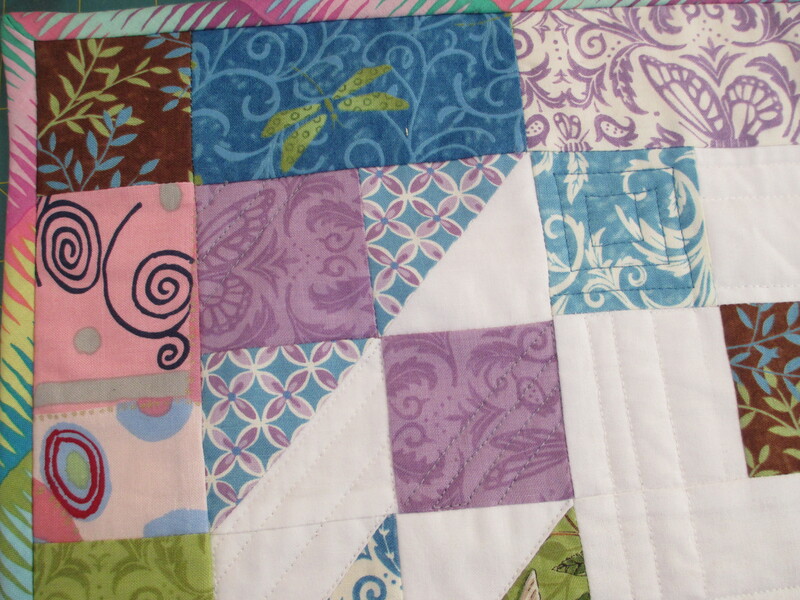 I decided to use a different material for the binding than the remainder of the charm squares – I think the Kaffe Fassett fabric cut on the bias picks up the colours of the quilt quite well. 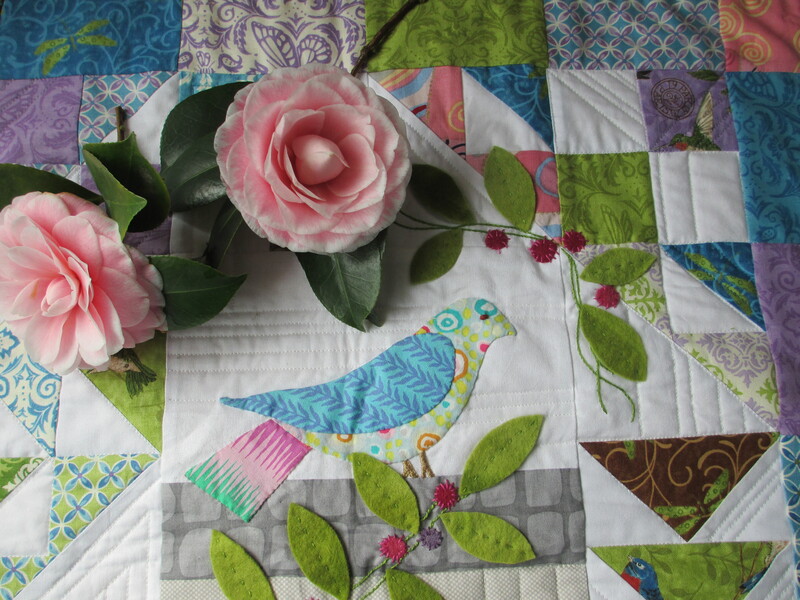 My garden has some beautiful camellias in flower at the moment, and so I couldn’t resist picking two to complement the colours of the quilt. 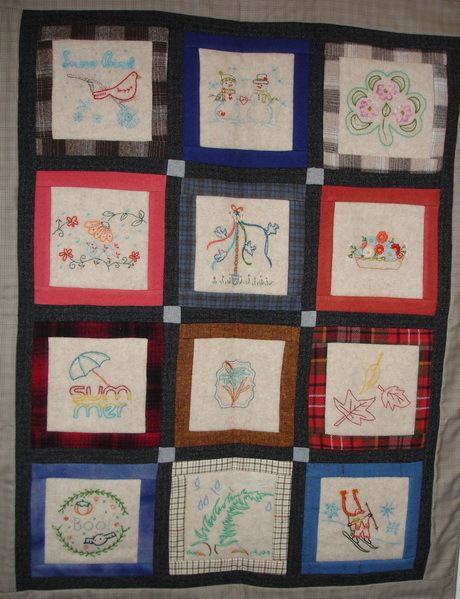 When I finished my quilt someone said how spring like it looked. As I don’t have anything for the “spring season” I am happy it looks fresh and light. 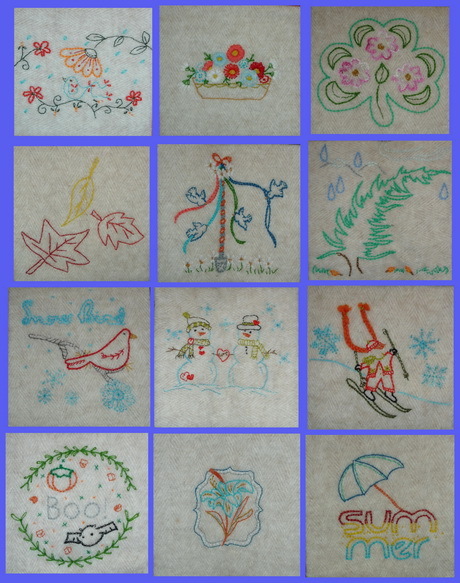 Yesterday, I went out for the day with my patchwork friendship group so I ran out of time to prepare a ‘Tuesday Treat” this week, but all is not lost as it has given me an opportunity to share a “Wednesday Wonder” with you. Here is my finished Aurilux project. 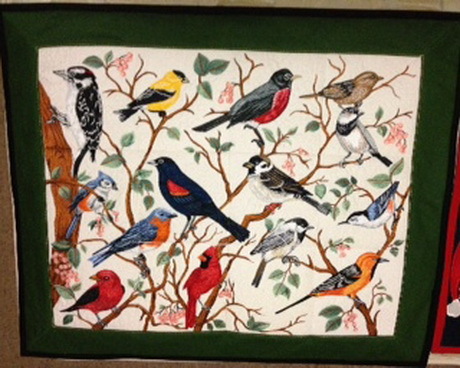 The designs are from the Anita Goodesign collection called song birds, I am very happy with it , the threads are wonderful. 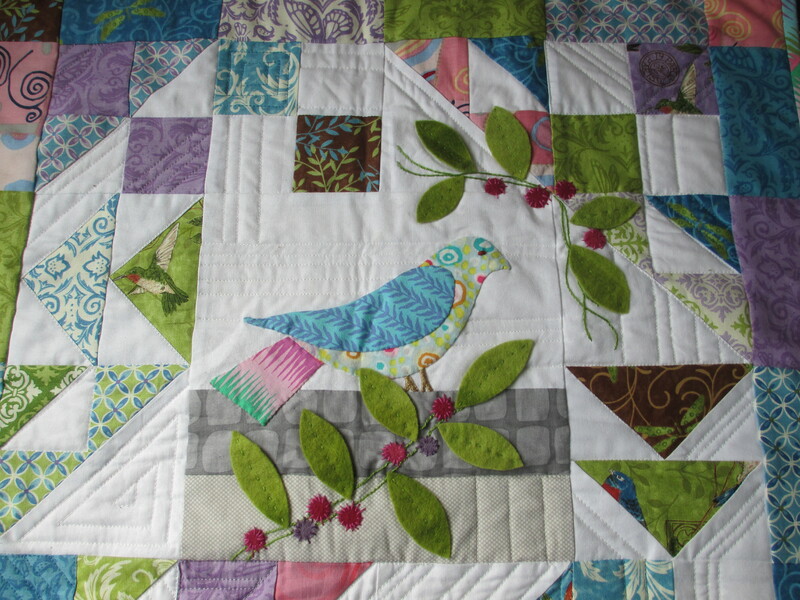 A close up of one of the birds in the design. ……. I really like the Aurilux threads and have been contemplating buying the full set for a while now as my few colours are a bit limiting I also noticed your wonderful new cotton mako chest they look very smart wish there was one for the Aurilux. Here is my latest project using Aurilux, it has so much more texture than if done on other threads. 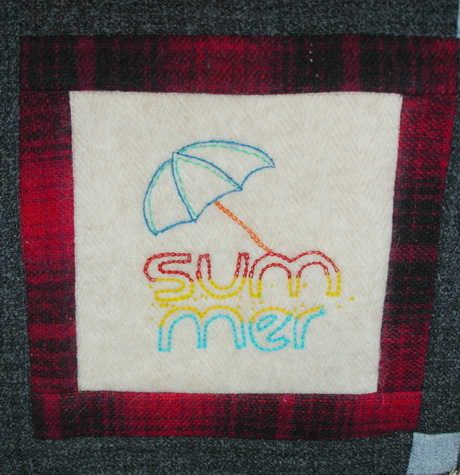 It is a real treat for us to see the work that people stitch with the Aurifil threads. If you would like to see your project featured in a future “Wednesday Wonder” send us an email with a good quality photo, and some information about the project and threads used. I received an interesting question this week about how to solve the spotty effect that happens when the bobbin thread pulls up to the top, or the top thread pulls through to the back, when you are quilting. I know some people like to make this happen deliberately when they are thread painting as it can add an extra highlight colour but, for other people, it can be very frustrating when quilting. The black thread popping to the top didn’t look too bad in the photo above but look what happens when the light portion of the variegated thread pops to the back of the quilt. I’ve been trolling the Internet and just thought I would ask you as I can’t find the answer that I need. 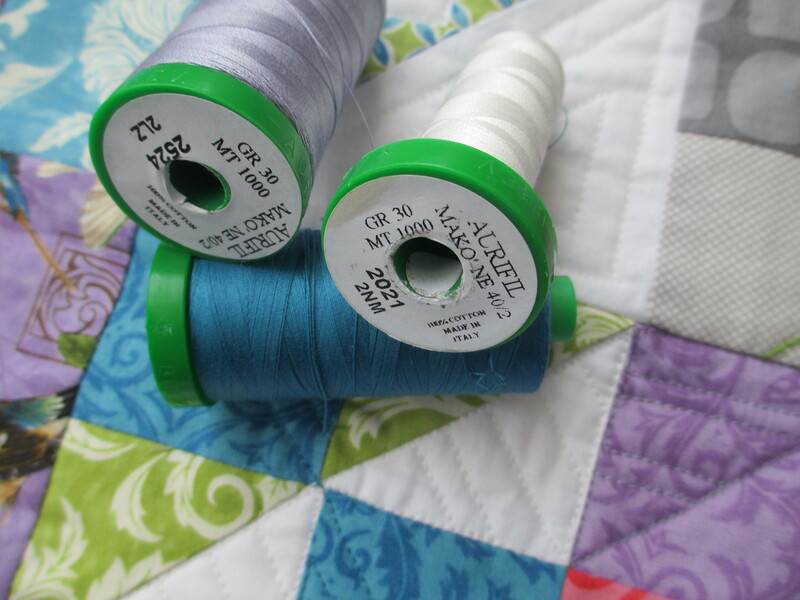 I am using Aurifil 50w thread for quilting an all cotton quilt, batting as well. I am using a red thread on top and a white on the back. No matter how much I adjust the tension in both the top and bobbin I’m either getting a red dot of fabric thru the back or a white dot of fabric thru to the front. 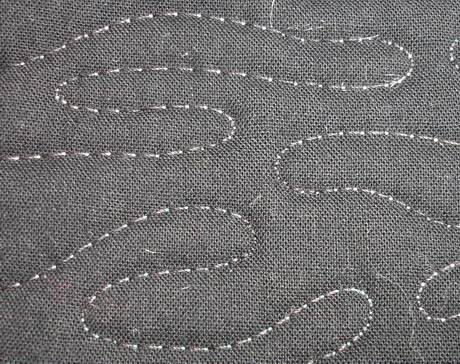 I’ve changed to the finest needle I have which is a 60/8, thinking that by creating a smaller hole this might help. Can I ask please, what needle size you would normally recommend with this thread weight? Any help will be greatly appreciated. Longarm Quilters call the phenomena that you are talking about “Freckling”. It happens because two very strong contrasting colours are used. 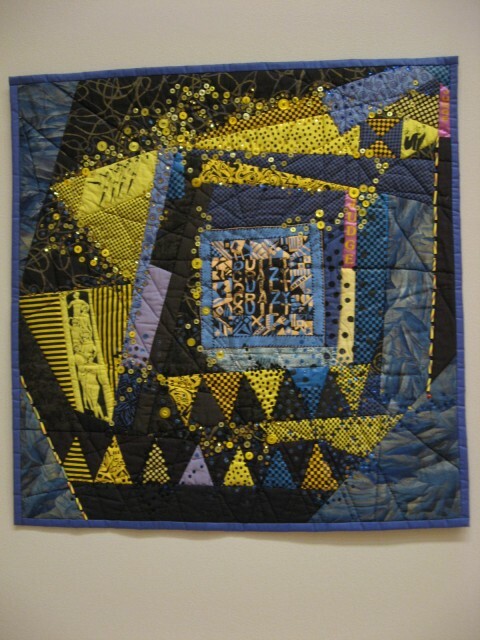 When quilting, the machine is being forced to work in manner that does not allow the needle to penetrate the fabric to pull up the bobbin thread before the machine (or in this case the quilt) has been moved. Ideally the needle & bobbin thread should form a lock in the middle, between the layers being stitched, but because of the way we move the machine head (or quilt top) this does not always happen perfectly when quilting. If the machine was stationery, and the feed dogs were moving the fabric under the foot in a controlled manner, as happens for general sewing, there would be less freckling but there is still no guarantee if 2 very strongly contrasting threads are used. A different needle will not make a difference. The only way to reduce the freckling is to compromise with the thread colour to reduce the contrast between the colour of the thread in the needle & bobbin. Try a softer red & a creamier “white’ to reduce the contrast. Jenny thanks so much for your email. It is the strong contrast that’s doing it! Strong red and plain white! I’ll experiment with some other colours and see if I can’t find a compromise. I really do appreciate you taking the time to answer my email. I was completely frustrated and knew it wasn’t the thread or machine. Now I get to go and buy some more Aurifil lol. The solution to my “freckle” quilting above would have been to use a solid coloured thread in the bobbin that was in the same colour family as the variegated thread. I know that If I can twist the needle & bobbin threads together, and they blend rather than shout out, any freckling in the stitching will be less obvious and the colour more consistent over the entire quilt. I always match a solid thread colour with a variegated thread to minimise the effect of freckles. 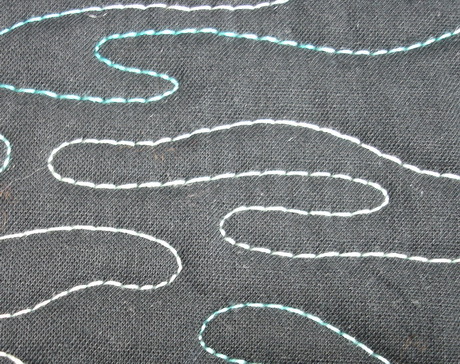 This twisting trick works for highly contrasting solid thread colours as well. If you must use a different colour in needle and bobbin then find a compromise with the threads that allows them to meld together to form a new colour that will sit well on the quilt. 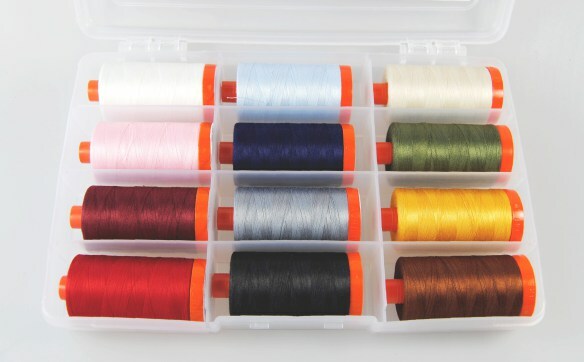 Of course it is sometimes also necessary to adjust the needle or bobbin tension to loosen, or tighten, one of the threads but that is answer for another time. We plan to make “the answer your question” post a regular feature so do send us a question and we will see if we can help. No guarantees but we will do our best. Some thread colours are clever, they are chameleons, changing colour depending where they are used and I am not referring to those old solar-active, colour change, threads from last decade. This week we had several requests to pick piecing colours for customers, and this started a lively discussion among the staff. Should we pick true clear colours for each colour family? Do we pick light & dark colours? Do we include black & white? and so the discussion went. We eventually settled on colours from each colour family, but chose muted versions of the colour where some black had been added to ‘dirty’ the true colour. This softened version of a colour will absorb, rather than reflect, light so that the thread will disappear into the colour of the fabric. 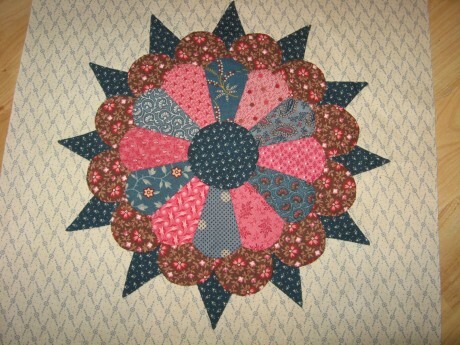 Our selection was also influenced by the fact that we were picking colours for patchwork rather than for general sewing. When dressmaking, you are usually stitching the same fabric colour to itself so the thread colour chosen is based on the colour of the one fabric. 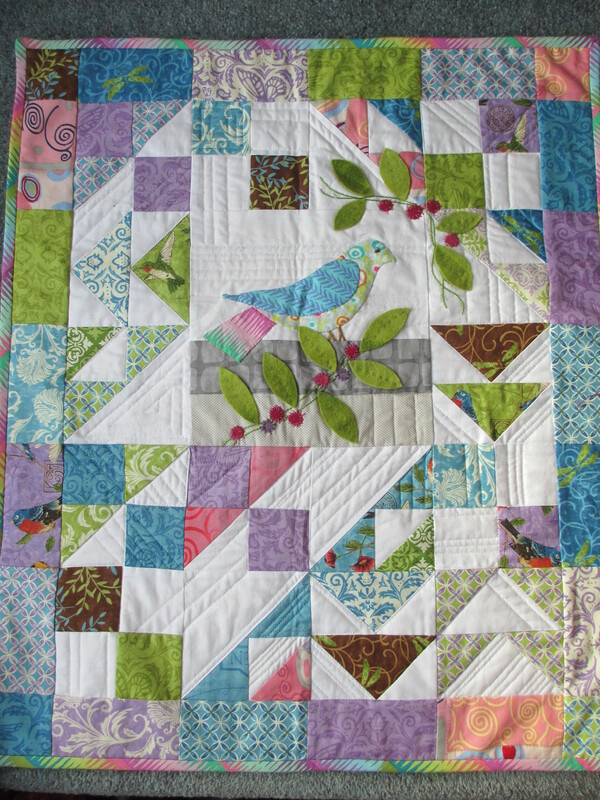 However, when joining pieces together for patchwork you are working with light, medium & dark shades, to create the pattern, so the thread has to work across both light and dark fabrics. Then add in the complexity that the pieces will often be cut from a multitude of different colour families to make up the light, medium or dark pattern piece and it starts to make sense to choose a thread that is not a distinct colour. This is where our idea of using chameleon colours comes into play. Rather than matching the thread exactly to the colour of the fabric, look for a colour that will blend across the fabric colours. 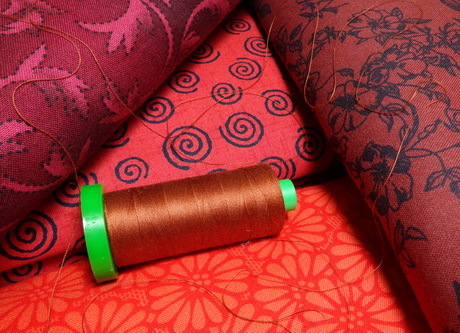 This brown thread blends very well with fabrics in the red family. 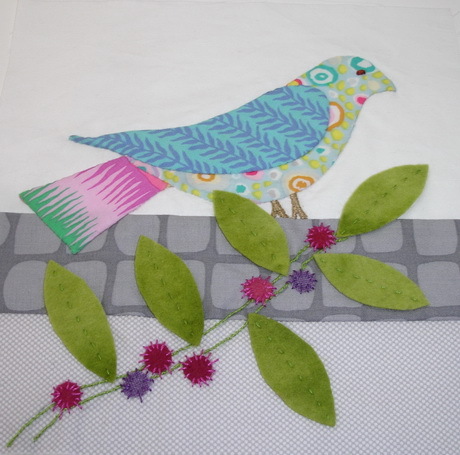 I am not a fan of the “I only piece with Grey” thinking, I much prefer to use a thread that has a connection to the colour family that is being pieced. This may mean that a brown, with a hint of red, will work better than a thread that is a true red or a dirty khaki green could be better than a thread in a more distinct green colour. So our final selection included light, medium & dark colours within each family that had been muted by the addition of black. We also added in a true bright white, as anything else would look wrong when stitching a true white fabric, and some very dark colours for the times that you are working with a rich dark fabric palette. Download a list of our favourite piecing colours to build your own piecing thread collection. 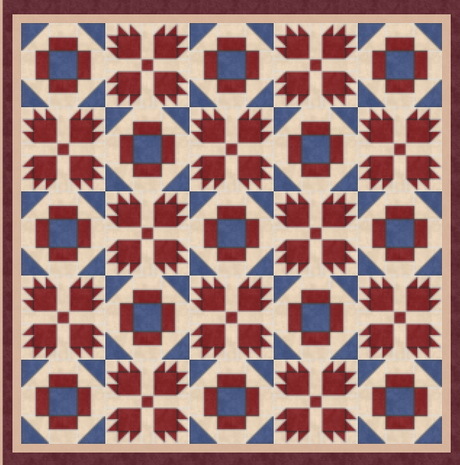 The piecing colours, suggested in the list, will work for both hand and machine piecing. Please leave a comment to tell us about your favourite piecing colour. The internet is overrun with competitions of all variety but every so often I come across a simple one, like this, that really is worth sharing. 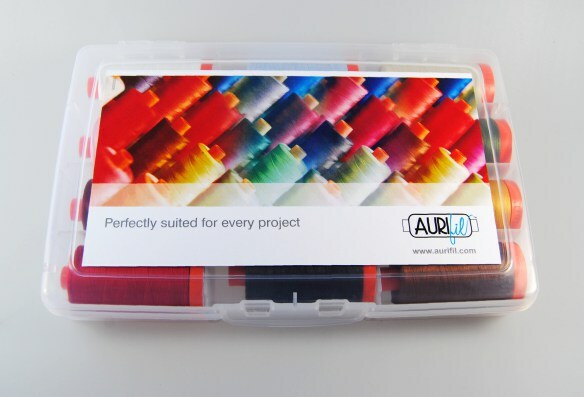 The AURIbuzz blog, the official Aurifil blog, has a great competition running at the moment to win an exclusive box of 12 Cotton Mako’ threads but be quick as it closes on 15th August. It is really easy to enter. 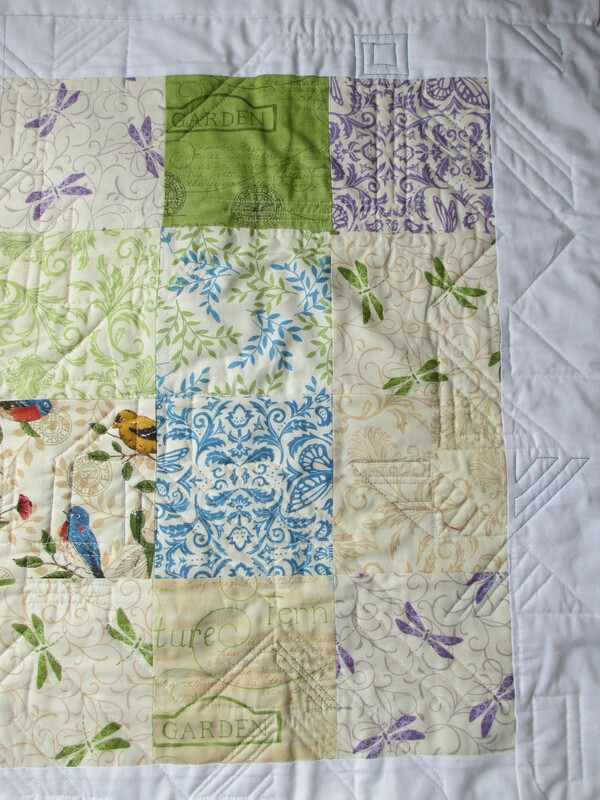 All you have to do is visit the AURIbuzz blog and leave a comment answering a simple question about your favourite quilting style. 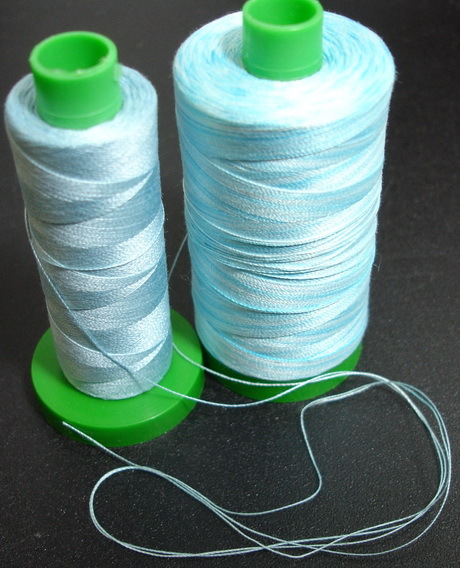 And here you can see the thread colours inside the box. However, here is my tip! Take the time to read the blog post first before scrolling to the competition question and comments. 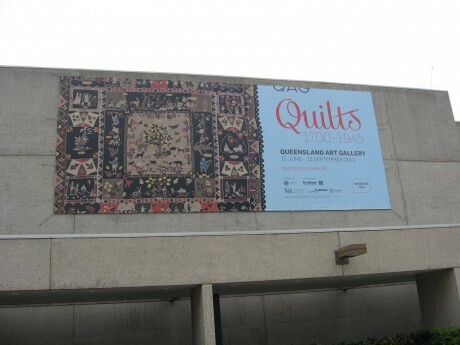 It features a very clever art quilter, Luke Haynes, and the photos of his portrait quilts are worth a look. 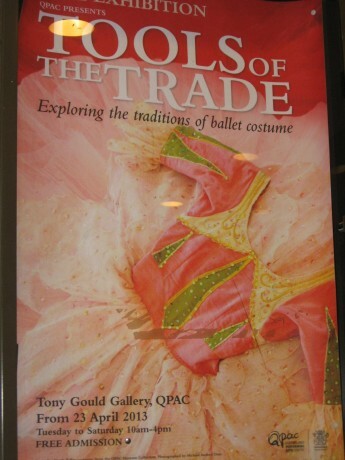 The competition is open to international entries and closes on 15 August 2013 so don’t waste time. You could be the lucky winner.